My finished Cricket, photographed at twilight on the back porch. It's too big for Mimi right now (I think it's a size 2T), but oh how I love love love love this sweater. Isn't it classic? I think it looks very Narnia. It was sort of the perfect knitting experience: Not complicated, but interesting enough to stay interesting. But not so interesting that I ever got stressed out. Enough stockinette that I could chill (while watching Real Housewives of New Jersey [don't tell Andy; he cannot stand it when I watch RH]) and not so much 1x1 ribbing that I went cray-cray switching between knit and purl. I used Jeny's Surprisingly Stretchy Bind-Off for the bottom, but I wish I hadn't (though this is an awesome bind-off, it probably is not necessary here, I don't think, and it's a LOT of visible bind-off, AND I did it in knit, not in pattern, which was dumb). I bound off normally (but loosely) on the neck edge and the button bands and I think it's much prettier. I also added a grosgrain ribbon to the inside of the button band (this is in the directions) and I'd never done that before. I think it came out really cool except that my ribbon should have been a little wider. But I was impatient and they didn't have a wider ribbon in that color, and I wanted that color. Enough about me. But oh wait, if I can say one more thing about blocking your knitting: If you've never done it before, you should really try it. That first photo, without the buttons? That's the same sweater, finished but unblocked. The three photos further down were all taken after blocking. That's the only difference, but isn't the difference amazing? Maybe you have to be a knitter to think so. But blocking will make your sweater (and, I daresay, you) very happy. I block everything, even bunny sweaters. I wouldn't miss a chance. (I'm easily entertaintained. See above.) And as far as hand-washing and re-blocking sweaters (because yes, you do have to block again after you wash, and I only hand-wash handknits), it really doesn't bother me at all. I figure if I can find that much time to put into knitting a sweater, sparing a few minutes to take care of it is kind of a drop in the bucket, and also well worth it. 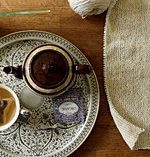 I actually love the process of blocking and I look forward to it a lot during the process of knitting. I think that one of the truly fun things about knitting is just that sense of discovery — what's this thing really gonna be? (That's why knitting the second sleeve and the second sock is such a pain — you already know what it's gonna be.) But blocking, in addition to finishing your piece off really nicely, just ultimately finalizes things, and that seems to provide [to me, at least] that one last element of transformation and surprise (albeit, it's not like a surprise twenty-first birthday party; it's more like a "Surprise! There's a dollar in my pocket I didn't even know I had! Snap!" sort of mild, pleasant surprise) that I think is one of the best parts of making anything. Chicken and rice pilaf? From Nigella, who I'm in love with again. I wish someone would write a new biography of her. The pilaf was a bit dry, but good. And pancakes, thin and topped only with a bit of sugar the way I like them, for dinner last night, with the leftover strawberries and a banana blended into a Greek yogurt (leftover from Nigella's chicken marinade) smoothie for breakfast. Double snap! Whisk eggs, flour, sugar, and salt together into a smooth paste. Slowly whisk in milk until just combined, then add a bit of oil (just to keep them from sticking) and stir again. Ladle or pour the batter onto the griddle over medium heat, and tip pan to swirl batter into a thin circle. Flip when edges look dry. Beautiful sweater Alicia! If I were a knitter, I would surly be blocking as well, it is just that extra finishing touch that makes it more beautiful! I love seeing Amelia in that yellow sweater so sweet! Pretty pictures and colors and Amelia. Thanks for that recipe....I will make those tomorrow! I am impressed with all you do with being a mom, your handiwork, and your yummy cooking! Am I imagining a resemblance between Andy and Amelia? The sweater turned out darling. She is going to get a lot of wear out of that this winter. That sweater is stunning! I want one for myself! I love seeing pictures of Amelia! She's getting so big! The sweater is so pretty! I love the pattern. Your sweet girl will look so cute in it. She is growing so much, and looking more grown up. Beautiful sweater! Mistake though...that is my family's recipe for NORWEGIAN pancakes...kidding, kidding. Stunning photos, as usual. Love them. A "bloop" of vegetable oil . . . LOL!!! Especially since I understand EXACTLY what you mean! The recipe looks intriguing, reminds me of French crepes, I think they'd be lovely with the blueberries that are coming into season here in southern Virginia. The sweater is magnificent! In addition to your love, little Mimi will always have your knitted treasures to keep her warm. I love evrything about this post..as always.. But must tell you the embroidery pattern..vest(?) I am smitten with..I lost my mom when I was 19..the last thing she made for me was a black velvet bolero vest(to wear with palazzzo pants..which were very IN in the early 70's)..embroidered..with such similar flowers..similar colors!I still have it..it could be a twin..:)A jolt to see this here.. 40 yrs later..so similar! I can't wait to see what becomes of the Scandi-embroidered item. Your embroidery is perfect. That's a skill I really want to learn. I have that very same book on Scandinavian design......you're putting it to much better use than I am! That girl is one lucky lady to have you as her mama! So adorable and the clothes gosh the clothes and love put into every stitch. AMAZING. Don't get me started on HW's my son came in the living room tonight and asked "mom can we watch orange county house?" yep thats my boy...yikes. It's just so lovely reading your blog, I have read it for many years. You two are so in love with parenthood and it's wonderful to see. You have the sweetest baby and I love sharing in your joy and wonder of Miss Amelia growing and learning. Oh My! Narnia and any local sheep dog trial that may be around. Precious! My pattern that I bought is driving me a bit crazy! I will email it to you and see what you think. I love what you said about blocking. While I'm not a knitter, I am a quilter and I feel the same way about washing and pressing the quilt once it's finished. Something about that last step makes it feel final and transforms it into something useful and cozy instead of something that's just pretty. I know we all keep saying it, but Mimi looks so exactly like Andy, especially her smile in "1Greta5." I guess it makes sense to see his smile on her face, as we learn facial expressions by watching. But still! I feel just the same about the discovery of the project as it develops--that's so much part of the creative fun of making the thing in the first place. Even though you have a picture or a pattern sometimes, the three dimensionality--and your yarn choice and etc.--make the whole tactile experience sort of addictive, don't you think? Your daughter is beautiful and seeing her sweet face makes me pine for the days when my kids were babies (temporarily!). It's funny how she really seems to look like your husband. The sweater is beautiful and luckily I now have a new niece to knit for - I may try this pattern next fall, as i am in the thick of gardening season now. I will be sure to try your blocking pointers. You have a gorgeous daughter. Such beautiful coloring and sweet smile! Her bedroom looks super cozy. I want mine to look like hers!! Oh I just love the sweater! And the embroidery! I must learn NOW! 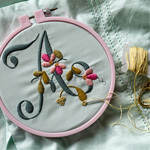 Is your book suitable for beginners, or would you reccomend something in particular for a novice embroiderer?! Gorgeous sweater, gorgeous Amelia. I'm tempted to try out that sweater pattern. Beautiful and inspiring pictures as always! Oh and that embroidery wow!! !